So the senate was now resolved to do battle with the upstart Maximin. Everyone’s hopes were invested in the Gordians, who they felt represented the best of the traditions of Rome. Envoys to the rest of Italy had quickly established a high level of support in the heart of the empire. The problem was Maximin had the army, and he knew how to use it. Once the excitement of the rebellion had died down the sober assessment of the situation was bleak. What could stop a march into Italy by the legions. And the nominal leader of the revolt hadn’t even made it to Rome yet. In fact, he was never going to – as the Senate deliberated the situation in Rome things changed radically in Carthage. A small number of troops guarding the frontiers in Mauritania, with some barbarian allies, had responded to the threat to their paymaster by invading Africa and advancing towards Carthage. The younger Gordian led a large but untrained levy out against them. They were no match for real soldiers and were easily defeated. Gordian himself was killed – an heroic but futile sacrifice. His father, despairing, killed himself on hearing the news. The revolt in Africa had lasted barely over a month. This not only deprived the Romans of their new found leader – it also made apparent what must have been obvious. There was simply nothing that could stop Maximin reasserting his authority in exactly the same way. But given the tyrant’s personality, there was no option of surrender either. He would show no mercy whatever the circumstances. All they could do was meet whatever was in store with as much courage as could be mustered. A senator called Trajan, a relative of the great Trajan, summed up the situation they faced in a crisis meeting in the Temple of Concord. It was a council of despair, but there was no other course open. And so the senators Maximus and Balbinus were selected to try and save the hopeless situation. The team looked good on paper. Balbinus was an experienced and effective administrator. Maximus had had a successful military career. But no matter how good your skills are leading an army, it isn’t going to be a lot of help without an army to lead in the first place. Italy had not seen fighting since the establishment of the empire by Augustus. The country’s defences were long neglected and the Italians as unused to combat as the heroic but unsuccessful younger Gordian. But before they could even get started on putting together some kind of defence, yet another crisis suddenly forced itself onto them. The people rose up, surrounded the Senate and demanded a third emperor be appointed. From somewhere they had found the 13 year old grandson of Gordian who they now wanted to be appointed as a third co-emperor. 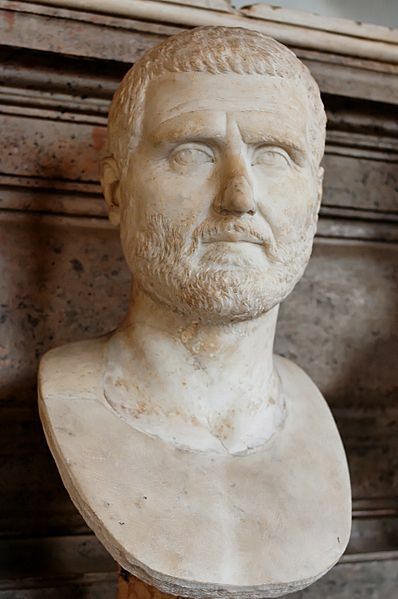 Disunity was the last thing needed at a time like this, so the Senate consented and Gordian the third became the latest imperial member of the house of Gordian. Few dynasties in history can have got to their third emperor in less than three months. How did Maximin respond to the challenge to his position? It is reported that he greeted the news with the fury of a wild beast and was so angry that he threatened to kill those about him, even his own son. If true, he seems to have calmed down pretty quickly. Rather than marching directly to Rome to put down the puny rebellion, he stayed to finish his campaign against the barbarians. He did not appear in Italy until the following Spring. Gibbon notes that this behaviour could indicate that he was not quite the monster he is portrayed as by the party that opposed him. He at least did not put the borders of the empire at risk in his haste to avenge himself. This enabled Maximus to put into practice the only strategy open to a general without effective fighting troops. The land was cleared of people and supplies and everything that could be of use to the invaders was removed or destroyed. When Maximin’s army finally made it into Italy it was to find that all the available supplies had been stripped and removed to the defensible cities. Supplying an army is no trivial matter so this was a serious blow against Maximin. But nonetheless, he still had the upper hand. He no doubt intended to act with speed. The scorched earth policy simply made speed necessary as well as desirable. The first blow fell on Aquileia. The city was well stocked with provisions and was defended heroically. The fortifications, built by Marcus Aurelius, although not well maintained were strong. Determination was evident on both sides. The attackers uprooted vineyards and pulled down the houses outside the walls to provide timber to build siege engines. The defenders used artificial fire to burn them down. Facing unexpected stubborn resistance in a ravaged country, it was not too long before the besiegers were starting to run low on supplies. By contrast the defenders were well supplied, their morale high and they were effectively led by some representatives sent by the Senate. The obvious strategy for Maximin was to break off and march on Rome. Maximus had only newly levied troops and some auxiliaries, but knew that a battle had to be risked if the capital was to be protected. The chances were slim but there was no choice. But in the event, the untried army was never put to the test. In the besieging camp disease and hunger had led to yet another revolution. With apparently no easy success in sight the soldiers had turned against Maximin, and killed him, his son and his closest advisers. They displayed his head on a spear to the defenders in the town. The gates were opened and the former attackers were allowed in for some much needed food. Rather than having to fight a desperate battle against the odds, Maximus advanced only to find a leaderless army ready to submit to the Senate’s authority. Maximus returned to Rome and was greeted outside the city by the other two emperors, who with him led a great triumphant procession. Against all the odds, the Senate had won. Power was now in the hands of two men selected by and from the Senate, not unlike the consuls of centuries earlier. The army had been brought to heel in a way that only shortly before could not have been conceived. And all this had been accomplished with minimal bloodshed. It looked possible that a new golden age had dawned for the empire.